Two years ago, I hadn’t laid a finger on a bicycle in this country for well over a decade. Today, I cycle to work every day and sometimes I even voluntarily go up hills at weekends. Nobody’s more shocked than I am at the transformation. Well, apart from my mum. And my siblings. And everyone who knows me. Since I’ve been extolling the virtues of cycling now for many months, several of my friends have tentatively shown interest in a bit of practice pedalling, but haven’t known where to begin. I’ve been there. That was me, for many years; enviously gazing at elegant ladies on their upright bicycles, occasionally sneaking a peak at Boris bikes stands, and wondering whether I should give it a go . . . but inevitably making excuses and abandoning my good intentions. I don’t want to give my boyfriend all the credit for finally getting me on the road, but sadly, I have to. He deserves it. Via the medium of a spectacular helmet, he coaxed me onto a Boris bike and look at me now: bicycle owner. Cycling blogger. Tour leader. In a manner of speaking . . .
Last weekend, at one of my book clubs (yes, I’m in two. They combine three of my favourite things: books, booze, and boring other people with the sound of my voice), powered by literary discussion and copious mojitos, it was decided: on Bank Holiday Monday, we would take to the road. Me on Grazel, my friends on Barclays Bikes Santander Cycles. It would be the very first Boris Bike Tour for the Nervous And Inexperienced Cyclist. I’ve written before about my tips for new cyclists, and this rather handily encompassed at least four of them; don’t buy a bike; go with someone experienced; don’t commute; stick to parks and side roads. The plan was to meet at Trafalgar Square, head down the Mall and up Constitution Hill, both of which have segregated cycle paths. In fact they’re closed to cars at weekends which meant we’d have the lovely wide roads to ourselves. Of course, my spectacular timing meant I had managed to choose a day when the streets all around Buckingham Palace were closed for the Green Park 10k. So not only was my route barricaded but the small paths which remained open were filled with rage-inducingly slow tourists. Isn’t there some sort of passport we locals can show, and be quietly ushered through crowds and obstructions without having to wait, impatiently, for sixteen Italian teenagers to take selfies in front of Buckingham Palace? Sort it out, Boris. So it wasn’t without palava, backtracking, lateness (mine), and brief forays off cycle paths into the categorically bike-unfriendly Green Park that we managed, finally, to rejoin the route and head, eventually, up towards Hyde Park Corner. Hyde Park was my goal since you can stay more-or-less on paths and segregated lanes throughout. We managed a zig-zag along the north side, down over the Serpentine, and back up along the Broadwalk past Kensington Gardens. It’s not only safe and quiet but actually very pleasant, and a route one rarely takes as a busy Londoner. Passing over the small but majestic bridge and seeing pedalos on the lake always gives me a “what a lovely city!” moment. I’d planned the route around Boris bike docking stations so that we could keep each section to under 30 minutes. Unfortunately the one just off Hyde Park Corner was utterly depleted of replacement bikes so we had to zip up to Park Lane instead. If I were to do this again, especially over a busy, sunny weekend, I’d probably aim for 20 minute rides before changing bikes, just in case. Unless you’re feeling flush, that is, and don’t mind paying the odd additional pound here and there. But I like getting my money’s worth so free rides it is. We went relatively slowly and cycled for about an hour overall. Apart from a scare on one of the few junctions we were forced to encounter, my friends seemed pretty pleased with the experience, unless they’re just really polite, which is of course entirely possible. I had an extra pannier to carry any spare bags and allow them to travel unencumbered, broke out my “teacher voice” for some basic rules of the road, demonstrated a couple of handy tips, and took the lead so as to relieve them of the stress of navigating. In short, I performed the duties that my boyfriend did when I first learnt the ropes myself. Basically I was conned into loving cycling because I sure as hell wouldn’t have discovered it on my own. And now that I’m an evangelising convert, I plan to surreptitiously indoctrinate as many other friends as possible, and if this has to happen by carrying their bags and promising edible rewards then that’s totally fine by me. Because yes, of course there was a picnic at the end. When is there ever not a picnic in London, if the sun’s out? Or at least, when it’s warmer than 15 degrees and not blowing a gale? 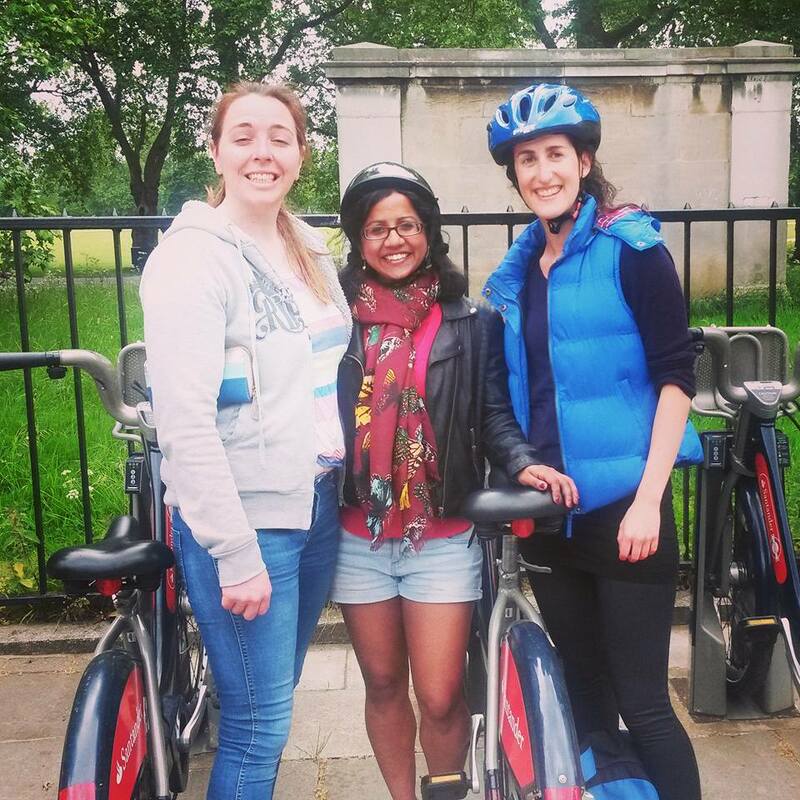 Why not get some of your friends together and have a Boris bike exploration of your own? All it takes is a single willing person to lead the pack. Or, if you know me (and you probably do), drop me a line and say you want to have a go. Hell, even if you don’t know me. Especially then. I’m easily flattered. I’d be delighted to lead a second Hyde Park tour and all I need are willing volunteers. It’s a great way to simply learn the basics, and get used to being on a bike again if your last one was for ages 8-10, and covered in flower stickers, streamers, and click-clack spoke ornaments. (Admittedly for some of us, certain things will never change). I’m also hoping to do a “stage 2” version (A Boris Bike Tour for the Nervous But Slightly More Experienced Cyclist) on real roads, but sticking to side streets and quiet cycle paths. This will be for people who in principle know what they’re doing, but still need to build up confidence when it comes to sharing with other road users. If you’re keen, give me a shout and we’ll get something set up. And before you know it, you too will be jacking in your annual Oyster card, buying a Dutch bike, starting a blog, and waxing lyrical to anyone who’ll listen about the pros and cons of roller brakes and Shimano gears. Haha, not really. I’ll tell you all about my cup holder though. It’s marvellous.